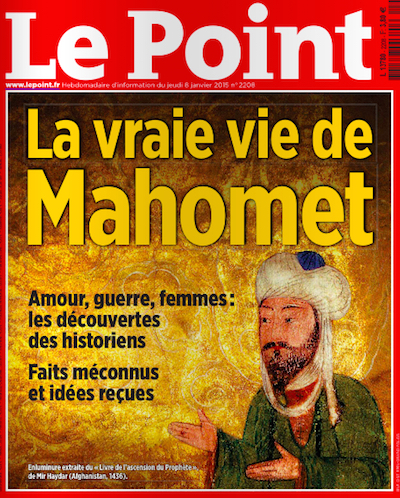 The current issue of French magazine Le Point, published yesterday, contains an illustration of Moahmmed on its front cover. The cover story, La Vraie Vie De Mahomet, is a historical account of Mohammed's life, illustrated with numerous paintings of the prophet, in most (though not all) of which his face has been obscured in accordance with Islamic tradition. Le Point's article is its response to the killing of several Charlie Hebdo staff this week. Charlie Hebdo published its own Mohammed biography, the irreverent La Vie De Mahomet in 2013 (part 1, part 2), with an expanded edition in 2014. Another French magazine, L'Express, printed historical images of Mohammed's face in 2008 and 2011.